This is a more politically friendly version of the traditional game hangman. 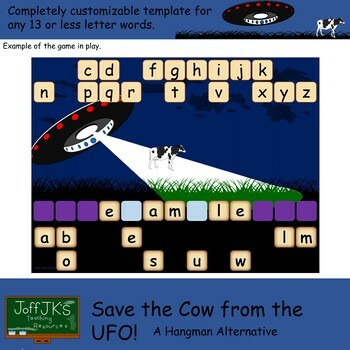 Save the Cow from the UFO plays just like the traditional game, but instead of drawing a hanged man stick figure for each wrong guess, a cow is beamed closer to the UFO. If they guess the word in fewer than 8 attempts, they win. 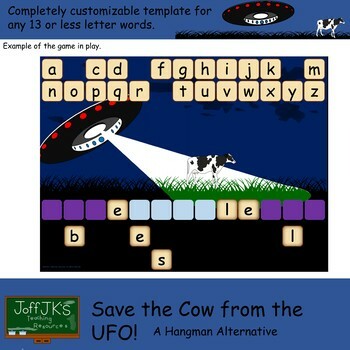 The file you will download is a template which will enable you to be able to create a slide for any word (13 letters or less). This template is designed to minimize the amount of prep time. You will be able to create a PowerPoint slide with your chosen word in under 5 minutes. This activity is great for a warmer, plenary, morning meeting or transition activity for elementary school students. ©JoffJK’s teaching resources all rights reserved.